Proper sleep is one of the pillars of health, but our modern lifestyles aren’t always conducive to adequate rest. Our sleep troubles are so common that the CDC has declared that insufficient sleep is a public health problem. Inadequate sleep can have a range of effects on your waking life from trouble learning and retaining new information to depression and an increased chance of developing diabetes. And surely I don’t have to remind you how important sleep is for skin health. In addition to setting good habits for yourself, like limiting electronics in the evening and following a routine, there are additional practices you can incorporate into bedtime that will help establish a soothing, relaxing environment. Setting up a healing sleep environment for yourself is not only practical and effective, it’s a real treat, so dim the lights and enjoy. Bedtime tea. I like to prepare an herbal tea an hour or so before I’m ready to go to bed. I’m really into chamomile and mint blends as well as rose teas for this purpose, and you can find lots of blends on the market that are formulated specifically to help encourage sleep. Valerian root tea in particular is a great sleeping aid, but the taste is pretty strong. Any tea will do as long as you love the taste and it’s naturally relaxing and free of caffeine or other stimulants. Drinking a cup of tea before bed always helps me unwind and it signals to my body and mind that it’s time to slow down and prepare for rest. Self massage. Once I’m in bed, I love to take a moment to massage the muscles in my feet, calves and hands using a rich butter. While I started this practice mostly to soften rough, dry skin, I keep it up because the massage aspect of it is so lovely, even though I’m doing the work. This doesn’t take much time at all, and it really helps you unwind and feel ready for bed. I love to use the Osmia Organics Lavender Body Mousse or Rosemary Body Mousse for this purpose because they have such relaxing scents. Give it a try and see if you’re not in a more restful state as a result. Your body will thank you for the healing touch. Aromatics. This is my most important tool for encouraging deep sleep, and I come at it from several different angles. You can turn your bedroom into a peaceful sanctuary through scent alone. Plants are particularly helpful here. I keep a vase of eucalyptus stems on my dresser to help clear the air and I usually have an additional vase of fresh flowers to add beauty and soft fragrance. If the air isn’t as fresh or calming as I’d like, I’ll burn a little stick of palo santo. The soft woody scent is cozy and relaxing, and it really cleanses the air around you. Once I’m in bed, after a little self-massage and right before turning out the lights, I love to spritz my face with an aromatic mist like the Lotus Wei Quiet Mind Energy Mist or the Kari Gran Hydrating Tonic in Lavender. I follow that with a concentrated aromatherapy treatment like the Lotus Wei Healing Sleep Anointing Oil. I love to dab a bit of the Healing Sleep on my palms, cup them over my nose and take 20 slow, deep breathes. Then it’s lights out. Sleep comes so easily after following these self care practices. If you’re having trouble getting the sleep you need, try incorporating these tips or create your own healing sleep environment using the same principles. Your body and mind will thank you for taking the time! This was delightful to read, Susannah. So many great & helpful ideas. 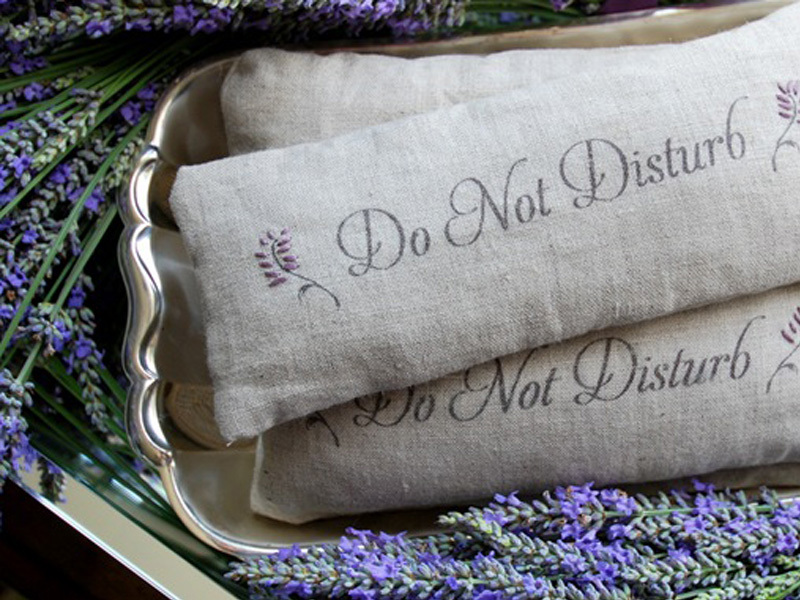 I adore the Kari Gran lavender mist but never thought to mist it on right before bed – what a peaceful idea. Kari’s lavender is my favorite version of lavender. I’m a certified herbalist/massage therapist and agree that sleep hygiene is very crucial. Just like Peter Rabbit, I have a cuppa chamomile tea (or the occasional passionflower and hops which isn’t very palatable but has more sedative constituents) which relaxes me after yoga and before meditation. Oh, and I listen to Dr. Deepak Chopra and I’m out like a light =). To your list I would add, sleep in a slightly cool and very dark environ, and meditate before sleeping is attempted for best results. I absolutely love your very diplomatic characterization of valerian tea, Susannah! Agreed. Carol, blue tansy is fantastic too! I make an oil serum with it and use it before bed. So dreamy.